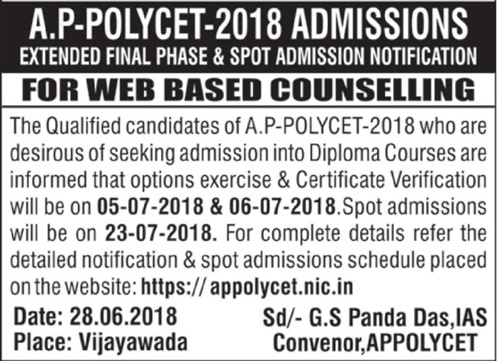 AP Polycet Extended Final Phase Counselling Dates 2018: Students can check Andhra Pradesh Polycet 2018 3rd phase (Final Phase) web counselling notification, counselling dates rank wise and Certificates Verification details are available at appolycet.nic.in. Who have reported/Not reported but cancelled their allotment. Candidates who have attended for certificate verification as per the above schedule. NOTE: OPTIONS GIVEN IN PHASE-1 & FINAL PHASE WILL NOT BE CONSIDERED FOR ALLOTMENT AND CANDIDATES HAVE TO EXERCISE OPTIONS AFRESH. Candidates who are satisfied with their previous allotment and reported at the college need not exercise option once again. They shall note that if they exercise options now and a seat is allotted as per the options, the vacated seat will be allotted to the next meritorious candidate and hence they will have no claim on previous allotment. Allotments will be placed on the website on 08-07-2018 after 6 PM. List of Help Line centers and other details please visit: https://appolycet.nic.in. It is advised to exercise options for interested Polytechnics/courses as vacancies may arise in the process of allotment (sliding) in addition to the left over seats. After conclusion of extended final phase admissions, detailed schedule for spot admissions, vacancies for spot admissions and guide lines will be placed in the website https://appolycet.nic.in on 12/07/2018.Spot admissions will be conducted at institute level on 23/07/2018. 6 S.M.V.M. Polytechnic , Tanuku, W.G. Dist. 1.1 Who can exercise options?